All Peggy Peg plastic screw-in pegs are produced from fibre-glass reinforced UV-resistant polyamide. At first sight the colour may seem a bit odd, but our Peggy Pegs can be seen more easily. 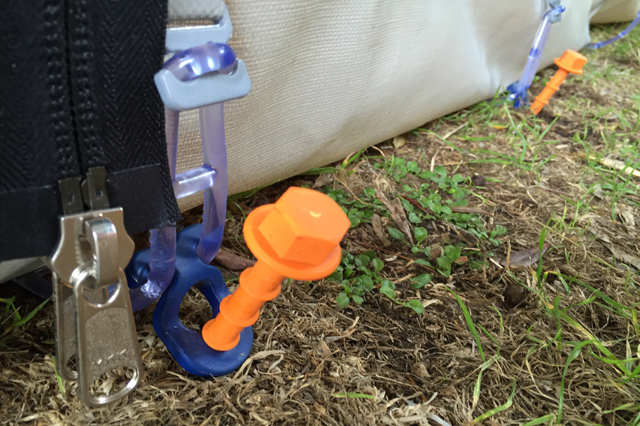 Peggy N is the height adjustable all-purpose Peggy Peg for awnings, cords and tents etc. Product testers travelling all around Europe have approved that Peggy N can be used in 90% of all cases by its height adjustment. Pre-drilling might be useful in hard or frozen grounds (take a 10mm drill). Very important: only continue to drill as long as the screw is driving in.